Aerial view of the Panda Stonewall facility in Loudoun County. Panda Power Funds has commenced commercial operations at its 778-megawatt “Stonewall” combined-cycle, natural gas-fired power plant near Leesburg. The plant is capable of providing the electric power needs of up to 778,000 homes in the Washington metropolitan area, the company announced in a press release yesterday. “Panda Stonewall is one of the newest, cleanest and most efficient natural gas-fueled power plants in the United States,” said Todd W. Carter, CEO and senior partner of Dallas, Tex.-based Panda Power Funds. Panda estimated that the project will inject $7.1 billion into Virginia’s economy during the construction phase and first 10 years of operation. The Bechtel Corp./Siemens Energy Inc. consortium employed 700 people at peak construction. The plant employs 27 full-time employees to oversee operations and maintenance of the facility. The plant, located four miles southeast of Leesburg, will use reclaimed water from the town to cool the facility. Panda Stonewall will be able to draw upon gas from either Dominion Energy or Columbia Gas, both of which pass through the plant site. The plant connects to the grid through an existing Dominion 230 kV electric transmission line that connects the Pleasant View and Brambleton sub-stations. Bacon’s bottom line: The press release does not say who will purchase Panda Stonewall’s electricity, but it seems reasonable to infer that the plant will sell into the PJM Interconnection wholesale market. As a combined-cycle facility, Stonewall will be a base-load facility, not a peaking facility. Panda Power would not have made the investment unless it was confident that it could displace older, more expensive electricity sources serving the Washington metro market. While a power plant theoretically can serve markets anywhere — power companies don’t control where their electrons flow — the shape of the electric transmission grid creates choke points, which get incorporated into the price charged to electricity consumers. I don’t know what the electric transmission grid looks like in the Washington metro area, but I would conjecture that Panda views the location on the metropolitan fringe as a competitive advantage for Stonewall over electricity wheeled in from greater distances. Additionally, the incorporation of state-of-the-art technology will make the plant more efficient than coal-fired plants and even older gas-fired plants. Reading between the lines, it appears that Panda thinks the power plant will pay for itself and generate a profitable return over a relatively short time line — 10 years. Why do I say that? Because the press release calculates the plant’s economic impact over a 10-year period. Admittedly, that is pure surmise and needs to be confirmed by the company. But if I am correct, it says a lot about the competitive advantage of natural gas as an electric energy source in the near- to mid-term future. Even if electric utilities in the Washington metro area — Dominion, Potomac Electric Power Co., and the electric cooperatives — begin building solar energy on a large scale, merchant generators like Panda calculate that either (a) they can pay off their investment and generate a competitive return within 10 years, (b) they can continue continue selling electricity profitably beyond the 10-year horizon, or (c) some combination of the two. Update: Panda spokesman Bill Pentak says there is no connection between the 10-year time frame of its economic-impact analysis and the company’s financial payback model. Additionally, he said that the $7.1 billion estimate of impact includes the multiplier effect of dollars circulating in the local economy. This entry was posted in Energy and tagged James A. Bacon. Bookmark the permalink. Interesting, Jim. Thanks for sharing! maybe add this map to give perspective on the geography of the utilities and their service areas. I would presume that the “process” is for a given utility to call PJM when they need more power… and PJM selects the low bid for power for that region… and delivers…. per the request. but there is a fly in the ointment – for base load and that is – why would any generator of electricity – run a baseload plant ..burning fuel 24/7.. if it did not have that power already sold to PJM? They just lose money hand over fist burning gas with no place for the electricity to go. I can see a peaker plant sitting idle and brought online when needed but I cannot see a base load plant sitting and burning fuel but no demand for it. So maybe the term “baseload” is not what is perceived and what Panda has .. is a plant that can be brought online to run 24/7 – when needed and it will not run when there is no demand for it. Otherwise … Panda is going to have horrendous gas bills if there are no customers. 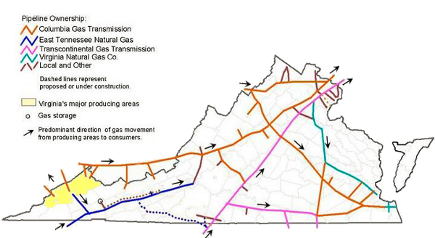 Second – I wonder where the existing Dominion gas pipeline is and where it comes from? Third – If Tom is correct and gas from the ACP pipeline will be more expensive than existing infrastructure – and Panda has contracts for existing gas – the “new” gas that Dominion plans on using to feed it’s new gas plants is going to be more expensive than what Panda will use to generate electricity and it will actually cost Dominion more to generate electricity than Panda. If this is true – Dominion is going to be at a competitive disadvantage to “old” pipeline gas and other potential competitors like Panda getting in the game. Larry, the wholesale power market does not work the way you are presuming that it does. For a merchant generator like Panda there are two likely scenarios. One is that the off take from the plant is contracted to a “load serving entity” somewhere within the PJM footprint. That could include both the generated energy and the capacity value of the plant. Every utility in PJM has capacity obligations and many, of course, no longer own any generation. A second scenario is that the plant has such favorable operating characteristics that enable it to bid into the PJM market at relatively low prices and thus “clear” the market every day. However, in that case it will not be paid what it actually bids, but rather the price of the highest accepted bid needed to meet the load for bid period. This plant is situated nearly on top of the Transco interstate gas transmission line, if I recall correctly, and had a very short interconnection with the DVP transmission grid. It’s new and highly efficient so should have comparatively low operating costs. It will run as much as it wants. That’s a whole lot of MW for a small footprint plant. Dominion also says their new nat gas plants are best in the world, but we should challenge all of them to provide their carbon intensity Lbs CO2/MWhr. I’d be curious to know if Panda (or Dominion) have plant tours to take a look. Perhaps a BaconsRebellion plant tour? I’d be a little worried about Larry on the tour, but maybe he would ask some good questions. Tbill, I hereby designate you as the official Bacon’s Rebellion representative to tour the facility and report back to readers! what WOULD be interesting is to hear Panda’s “take”… and see how it compares to Dominion’s! I’m not opposed to Dominion per se.. They are a good company who has done a good job to date – but they have some problems.. in the way they are portraying issues… and decisions that are perhaps good for them but ignoring some realities that will inevitably affect them – and ratepayers. For instance, shutting down the Yorktown plants like they have no options – like waivers… especially from a dramatically altered EPA… as a justification for powerlines over the James – as the ONLY option… it just defies belief. Similar issues with the pipeline and the coal ash. It’s pretty clear they rule the roost … or think they do. and yet .. it’s also pretty clear there are things evolving – like Panda and the Matex Virginia Power LLC gas plant in Chesapeake that apparently already has access to existing gas..and will not need or use ACP gas – even as Dominion argues that there is a “shortage” that justifies their 5 billion pipeline. The evidence is piling up that Dominion believes what it believes – but that’s not at all the truth from on high.. and if I wanted to get “the facts”.. I’d not seek them from Dominion … without a little checking with others – like Panda and Matex Virginia Power for two. The Panda unit is the first of four new units in Virginia that have been proposed by Independent Power Producers (IPPs). The Panda project was approved by the SCC in 2014. The other three IPP units are still under consideration. One is the Matex 1400 MW plant proposed in Chesapeake, another is the C4GT LLC 1,060 MW plant proposed for Charles City County, and a Southern Company subsidiary has plans to build a new gas-fired plant of unspecified size in Pittsylvania County. All of these units are in addition to those proposed by Dominion and ApCo. It is a mystery how the project will inject $7.1 billion into Virginia’s economy during construction and its first 10 years of operation. It is possible that some local contractors might get a few months of work from the project, but typically most workers will come from out of state because of the specialized nature of the equipment and the fact that architect/engineers such as Bechtel have their favorite national contractors. The only other source of funds would be from long-term employment. Panda says they will have 27 permanent workers. There will be local tax revenues, of course, but a plant that costs less than a billion to build will not generate $7 billion of tax revenues in 10 years. This sounds like the “made from thin air” numbers that developers typically generate to gather local support for their projects. The plant will connect to Dominion’s transmission system to have access to PJM. Dominion recently let some of its NUG (Non-Utility Generator) contracts lapse. It is possible that they are getting a portion of the output of this plant since it will be cheaper than the older units they had under contract. The Panda plant is one of many new gas-fired plants under development in PJM territory. There are 20 new plants proposed to be constructed in Pennsylvania over the next five years designed to use what they hope will be low-cost gas to sell excess power into PJM. Many others are also planned in Ohio, New Jersey and Maryland. The data centers are not a potential customer for any of these units because the data centers have specified that they want to be served by renewable energy. It is interesting that Panda and several of the other IPP units are having no trouble accessing natural gas in an area the ACP claims has no more available pipeline capacity. Only the plant in Chesapeake would rely on the ACP and that could be served by a much cheaper alternative, but it would require some construction on existing right-of-way. It is likely the plant would meet some baseload requirements during the summer and winter peaks, then provide intermediate load support the rest of the time. Perhaps it would run at a capacity factor in the low 70’s to low 80’s percent, at least initially. There is probably a short-term opportunity to displace less efficient gas-fired and coal-fired capacity, especially in the Maryland/DC market which currently has a higher cost structure than Virginia. I do not agree with Jim’s conjecture that the $7 billion number has anything to do with the plant’s ability to pay for itself in 10 years. The revenues would be from wholesale sales so no sales tax would accrue to Virginia. None of the profits would accrue to Virginia either. I don’t know where that number comes from, but I doubt that it would hold up to scrutiny. This unit is one of many that are being built to take advantage of the currently low price of natural gas and to sell energy into the PJM wholesale marketplace. This plant would have been planned during high-gas prices and built during low gas prices. Natural gas prices in the Marcellus have increased nearly 100% from a year ago and are on their way up; soon to be accelerated by LNG exports from Cove Point and elsewhere. This whole house of cards is underpinned by the assumption that demand will increase and each developer believes that their unit will be one of the “low cost” options. PJM’s forecast for Virginia shows that neither of the two 1600 MW “highly efficient” combined cycle units proposed last year by Dominion over the next 15 years are justified by projected load growth. If plants whose payback is guaranteed by ratepayers cannot fit into that market, how will all of these merchant generators succeed? These developers are also ignoring the speed at which the cost of renewables are coming down and undercutting the cost of conventional generation. Energy efficiency is reducing the need for more baseload generation. Maryland is considering embarking on a regulatory revision similar to NY REV. This would create an innovative, lower cost energy market in Maryland and leave little long-term opportunity for old style generation. That is why I am shouting “watch out!” to my friends in the utility business before they extend their old habits too far and fall over the cliff. The times they are a’changin’. I talked to Panda this afternoon. The $7 billion economic impact number includes a multiplier effect of spending circulating in the local economy. Also, Panda confirmed your suspicion that the 10-year economic forecast had no relationship to the economic payback, as I had conjectured. yes – it looks like there are plans to burn a LOT of gas for baseload! but there are also plans for a LOT of solar even if Dominion is not so high on them. I thought that one of the bills that Jim posted recently – allowed the electric cooperatives in Va to install solar. Since these utilities don’t generate their own power – but instead buy it… I wonder ho that would “work” especially with regard to PJM. it just looks like a lot of installed solar is going to impact the grid and require the gas generators to varying their output in response OR the solar itself will have switches to reject it when the grid has “enough” just as fossil fuel generators would shut down when grid demand reduces…say at 2am..I’m sure the power demand is 1/2 or less what it is at say 4pm. For the most part PJM does not coordinate solar, especially the smaller distributed units, since it is not dispatchable. Basically, changes in solar output throughout the system appear to PJM operators as changes in load. That is, as solar contribution is higher, PJM detects that there is less demand to fulfill and dispatches less supply, by telling the most expensive unit that is operating to curtail its supply, and so on down the line until supply matches demand. If in one portion of the system, heavy clouds diminish solar output, PJM sees that as an increase in customer demand and responds accordingly by dispatching the next cheapest source of energy. The PJM system has been responding like this for decades. That is why a moderate amount of solar (say 30% in PJM) can be accommodated without too much of a problem. Renewables are very stable within a 5-minute window and changes due to the amount of incoming sunshine can be accurately predicted now, so even though solar can be variable, those changes can be predicted and properly anticipated. If too much solar is concentrated in a portion of the grid that has not been updated to provide for two-way flows of energy and information you can have fluctuations in voltage or frequency that can cause problems. The solution for this is not necessarily to build less solar, but to build a modern grid. In locations with a higher penetration of solar, such as California, when a large portion of the peak and intermediate load is being supplied by solar, it can be a challenge to ramp up enough conventional generation to cover the load as the sun goes down and the contribution from solar declines considerably. On Kaua’i they are dealing with this problem by installing batteries along with solar to provide about 4 more hours of generation (from the stored solar energy) to get them through the evening peak. California is also installing significant amounts of storage and 10,000 MW of storage are out for bid in the U.S. this year. For much of the rest of the country, storage will gradually make its way into the grid as the price continues to decline. It can then be used to follow variations during the day, more rapidly and cheaper than gas-fired peakers, and extend solar energy into the evening hours, as well as providing other valuable grid services (voltage and frequency control, etc. ).